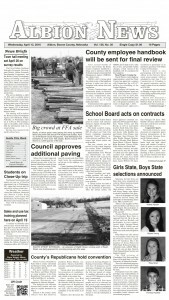 Static groundwater levels in Boone County have been gradually rising since the mid-1970s. However, the past year of drought resulted in a significant water level decline from March of 2012 to March of 2013. Lower Loup Natural Resources District recently published the results of static water level checks that were conducted throughout the 16-county NRD in March of 2013. 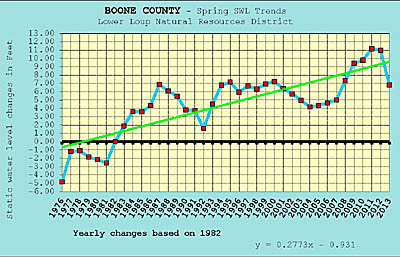 In Boone County, the average spring static levels declined by slightly over four feet, which is the largest single year decline recorded since 1976. That would be bad news, except for the fact that the county’s static water levels have been continuously rising since the “base year” measurements were established in 1982. The present static level is about six feet above the 1982 level.